The 2019 Season is ready to get underway as The De-Icer rings in the racing at Snydersville Raceway. A large field of Karts, Champs, Microstocks, and Slingshots are ready to pack the track with some dirt slinging action around the 1/8 mile Bullring! 2 rounds of Practice, Heats, and Features with Regular Payout and No Points are slated for Saturday’s action with the Gates opening at 10am, Drivers Meeting at 11:50am, Practice at 12:15pm, and Racing at 2pm. 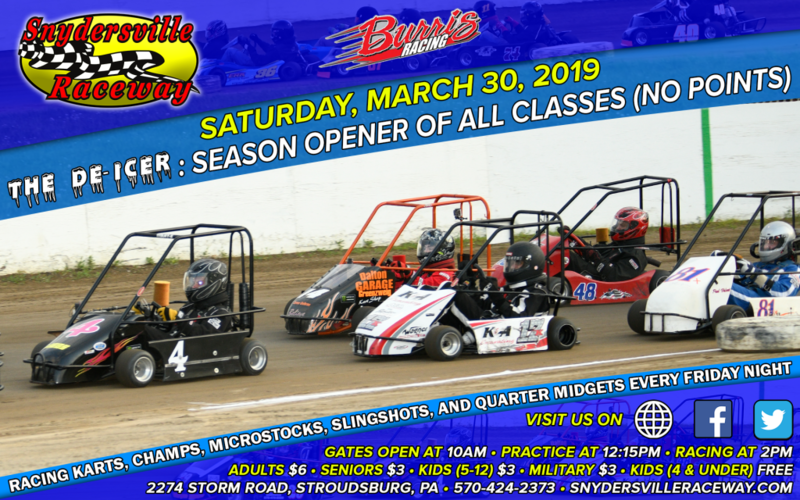 Come on out everyone and join us for and Action Packed Day of Racing in the Pocono’s to ring in the 2019 Season! See you all at THE VILLE!